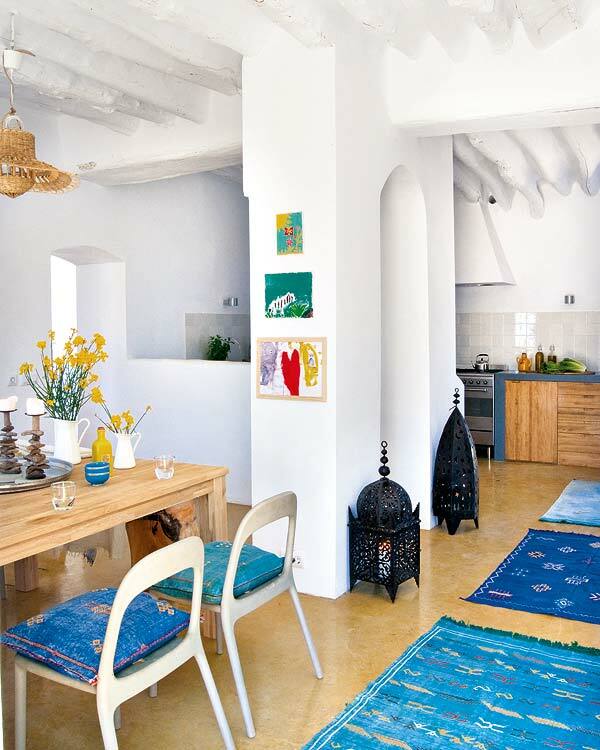 Bright colors, whitewashed walls, lanterns, baskets, colorful accents....yes, I know I am drooling :-) We are visiting a restored farmhouse in Malaga in Spain today. I spent two weeks in Spain one summer and I remember we flew into Malaga! These images don't help..............I so want to go back :-) Do spend some time and notice all the accents in this home. 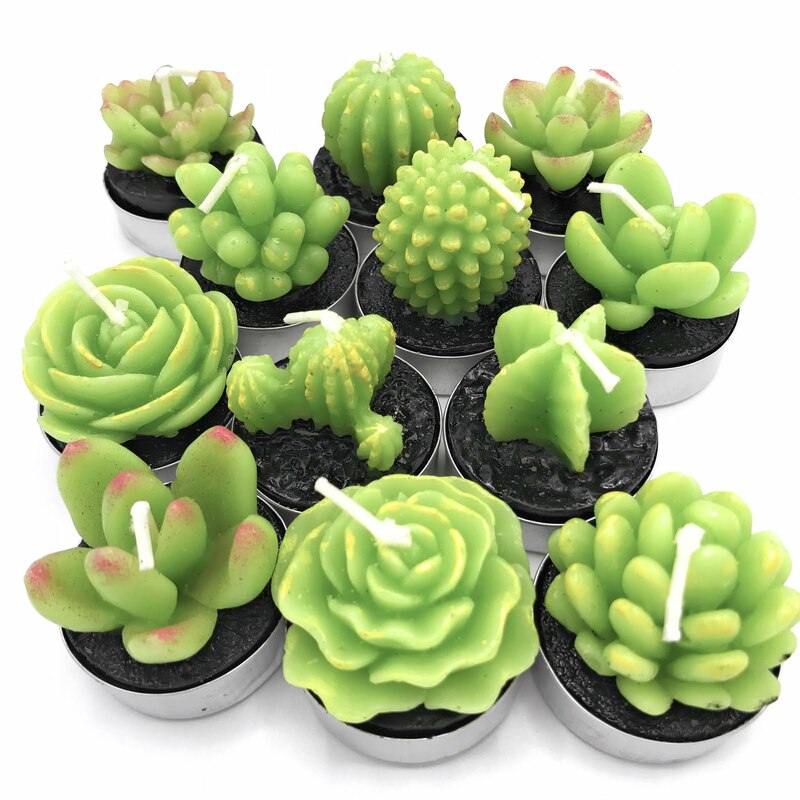 They are lovely!! 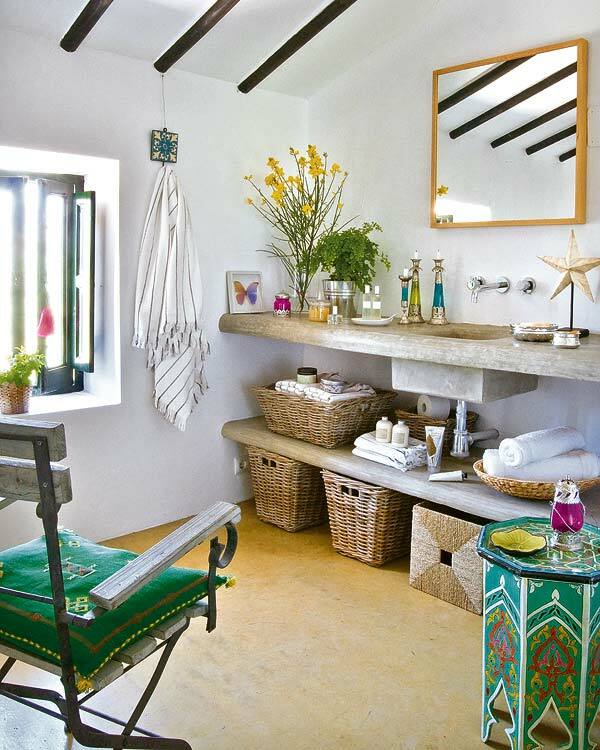 My favorite is the last image of the bathroom.........it's simply fabulous!! So, tell me which is your favorite room in this house?? 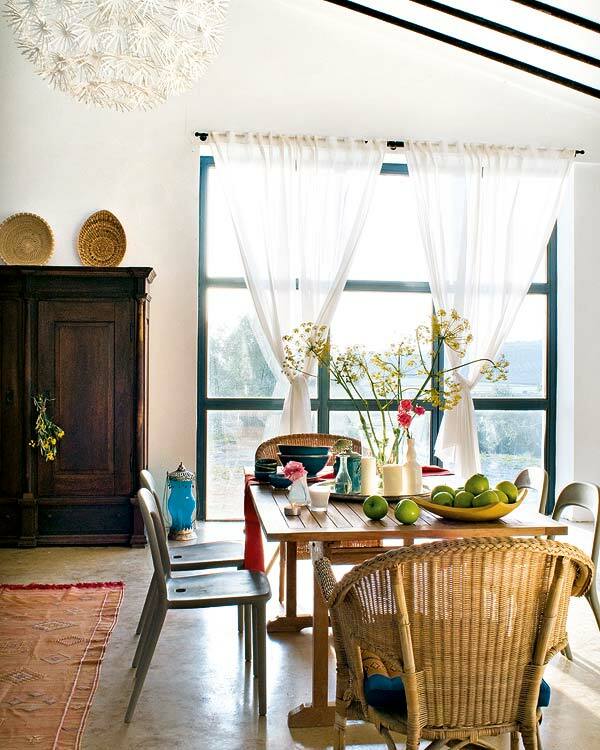 OMG, its an eye candy...these rooms! So difficult to pick a favorite. I love the wicker, the rugs, the lanterns and the blue lamp. It's gorgeous! Am so loving the windows!! Thanks for visiting and commenting at my blog re: the lightbox. I'm a new follower here! Yes yes yes to all of the above. Love all those textiles---I might "borrow" a few while I'm there! amazing... amazing.. the first two images.. are of the same room.. isnt it?? They are truly awesome!! super cool! why choose any particular pic! I don't usually like white walls, but I love these rooms! thanks for checking out our blog. Very beautiful pictures! I am really loving the light, the lanterns and the suzani. Just beautiful! 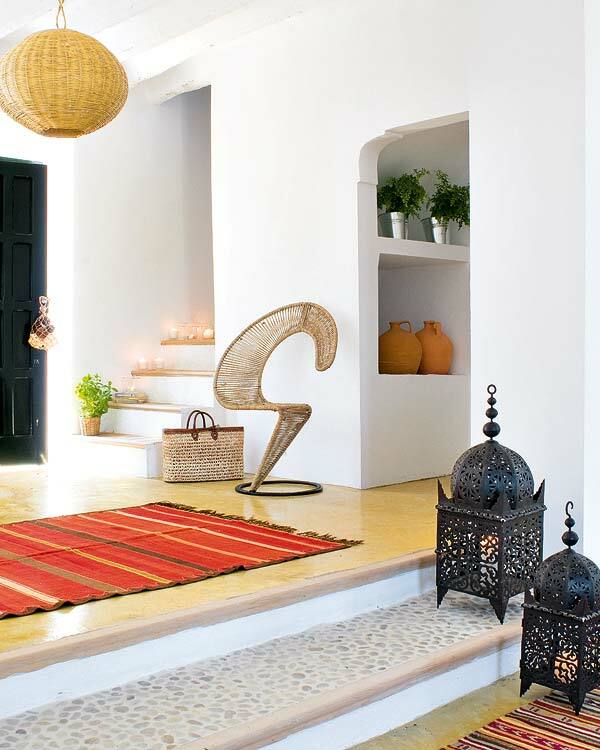 I love the row of 3 bright blue rugs... and those lanterns too! Wow!! I wish I could have just one room like the one in the first pic in my house. Big full length windows, sunlight streaming in, nice comfy chair :( Awww my wish list is endless. Loved the pics Anu!! Beautifully sleek and spacious. I like the bathroom built-ins too. Lanterns, peg tables...beautiful!!! Moroccan taking a full swing these days!!! Beautiful!! I love all the inspiration! Thanks for sharing! Wow what great spaces!! I love the bathroom too!! I love rooms with the look of ethnicity and travel. Beautiful post. I like all the rooms, but my favs are 1 & 5! I think I would pick the dining room, very rustic with a great view. Hi lovely lady I love all your Beautiful rooms sweet lady. But #one is the one for me ~~~Thanks so much for your lovely comments on my newest Tablescape. I hope you have a Great Week. I love all the beautiful rooms! Thanks for your visit! Beeyootiful rooms Anu! I loved best the dining room, pretty!! Completely love this home. I can just imagine all worries paling into insignificance in a lovely home like that.